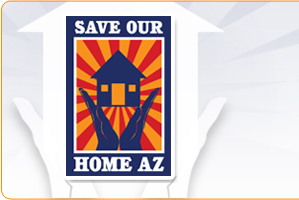 Welcome to the Arizona Foreclosure Help page. On this page, you will find direct access to foreclosure defense attorneys and non-profit organizations offering foreclosure prevention services. You will also find general information about the Arizona Foreclosure Process. If you need help with a troubled mortgage or foreclosure, this is a great place to find it. In many cases, these organizations will end up recommending that you retain an attorney. The fact is that an experienced attorney is in the best position to represent you in mortgage negotiations and foreclosure proceedings. In fact, THE FEDERAL TRADE COMMISSION (FTC) PROHIBITS ANY “NON-ATTORNEY” FROM NEGOTIATING MORTGAGE DEBT ON BEHALF OF A DISTRESSED HOMEOWNER. Negotiating yourself or through a non-attorney third party can even be detrimental. Before you do anything else, we recommend speaking with a foreclosure defense attorney or completing the NO OBLIGATION Foreclosure Defense Application. A: 82430 208 North 4th St. Web: www.takechargeamerica.org 20620 North 19th Ave. Web: www.primavera.org 151 W. 40th St.
For the most current list of HUD Approved Foreclosure Avoidance Counseling Agencies in Arizona, please visit the HUD website. Non-judicial Foreclosure:A foreclosure process where a third party Trustee has the power to foreclosure and initiate a sale based on a Trust Deed instrument. First Notice to Sale Time Period: 41+ days. Redemption Period? : Yes, 1-6 months. Deficiency Balance? : Varies by process.